The campo we were just at, Las Caobonitas, was an incredible time for all of us. It was challenging. Learning the language, living with new families, and working on an aqueduct were all difficult for us. We learned a lot about ourselves and other people in the world. We saw a simple life, but we also saw the challenges of water access. Many communities do not have water in the campos, and many in our community felt water insecurity within our families. It was not easy to deal with. We also felt the hospitality of the community; they welcomed strangers with open arms and took us into their homes. We played baseball with them, we went to school with them, we worked with them, and we lived with them. Their hospitality was extraordinary, and I don’t think anyone was anticipating what they would do for us. We had a party for St. Valentine’s Day, and our families surprised us there with a dance. Working at the aqueduct was rewarding and demanding at the same time. We worked on the same aqueduct as communidad catorce, and met some of the people from their campo experience as well. We moved a lot of tubes, dug ditches, and reburied tubes. It would be a disservice to the work to not mention moving sand and cinder blocks up the mountains to our work sites. Andres, the host father of Sarah Kelly, jumped into the flowing water from the aqueduct saying he could die happy knowing that he had bathed in the water for his community’s aqueduct. 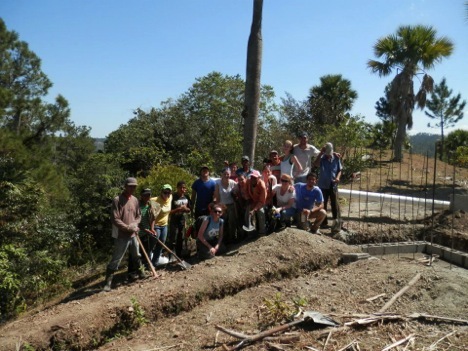 It was hard, but the lessons we learned and the inspiration from the Dominicans we met was worth the sweat. The people in Las Caobonitas also taught us about love and living in the moment. Our mothers, brothers, and sisters in the campo gave us so much; we played baseball and dominoes with them, shared stories of our childhoods, struggled through Spanish and were alive with them. We arrived as strangers, and left as friends, as family. We came home from the campo, and have been missing everyone there since, and following the campo, we began our spring break. We took some time to climb Pico Duarte, the highest mountain in the Caribbean, and we will be on the beaches later relaxing before starting school again. We have done a lot of work, and had some crazy adventures in the mountains and the cities of the Dominican Republic.